GETTING ACTIVE, INSIDE AND OUTSIDE! While the weather may not always cooperate, I love getting outside with my students when we're celebrating Earth Day. Here are a couple of tried and true favorite ideas. This would be a great tradition to start with your grade level. I don't know about your school, but our playground is often littered with snack wrappers, juice boxes, and other random pieces of garbage. One year, my students came up with the idea to clean up the playground for Earth Day. My team asked parents for donations of disposable gloves, or we just bought them ourselves since they're fairly inexpensive. We gave groups of four to five students a garbage bag to share, and let them go to town on the playground! Our custodial crew was very appreciative, and the playground looked great! 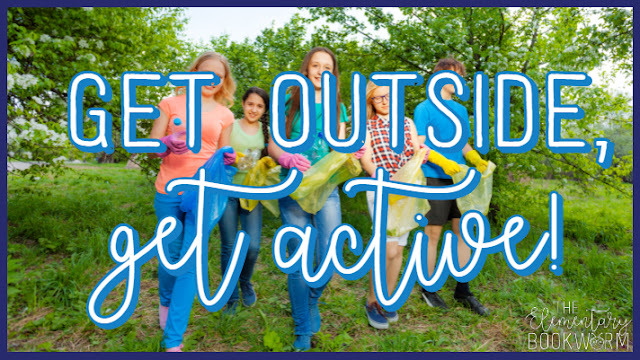 You could also have students make signs for the playground after the big clean-up to remind other students to take care of their school environment. Another idea would be to sort the trash into recyclables and waste! I LOVE playing Minute to Win It games with my big kids. They let their too-cool-for-school attitudes fall away and enjoy being KIDS for a little while. Last year, we used several of these ideas from Musings of an Average Mom to spark some fun at recess. It worked out perfectly as a HUGE rainstorm forced us inside for the day! INTEGRATE EARTH DAY IN ANY LESSON! I love to weave holidays and special events throughout our curriculum whenever I can. I know, it's nerdy, but if it makes math or test prep or language arts a little more fun for the day then count me in! 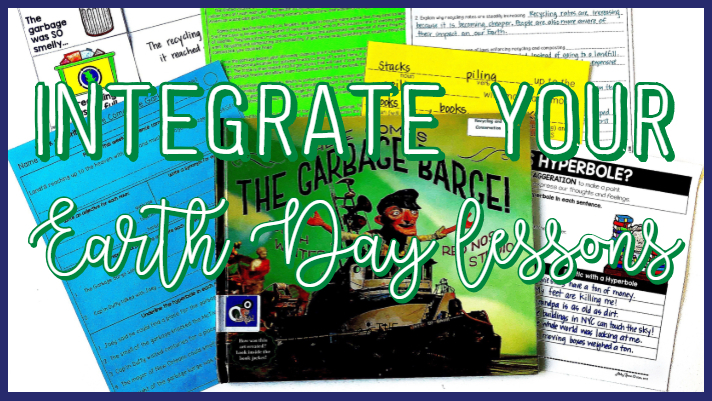 I love using any of the Michael Recycle books during Earth Day. One of my favorites is Michael Recycle Meets Litterbug Doug. Litterbug Doug is lazy, messy, and gross. He hates to recycle! His neighbors are suffering from the stench of his trash piles. Even the army of rats that accompany him are growing weary of His Grossness. Michael Recycle to save the day! We follow this up with a writer's workshop on Hero stories. Students design their own environmental hero and develop a story in which they are needed to save the day! We use DC Kids' Super Hero Me to design our heroes and go from there! Last year, I found Here Comes the Garbage Barge and had a burst of creativity. We made it our mentor text for the week and had a blast learning all about what happens to our garbage once it leaves our homes. One of the reasons I really love this book is that it's a part of Storyline Online's library! So if I don't feel like rereading the book, or if more than one student needs to use the text we have an easy way to get around that! We ended up with so many activities that I put them together in a unit that's perfect for Earth Day, or any time of year that you're studying pollution and conservation! 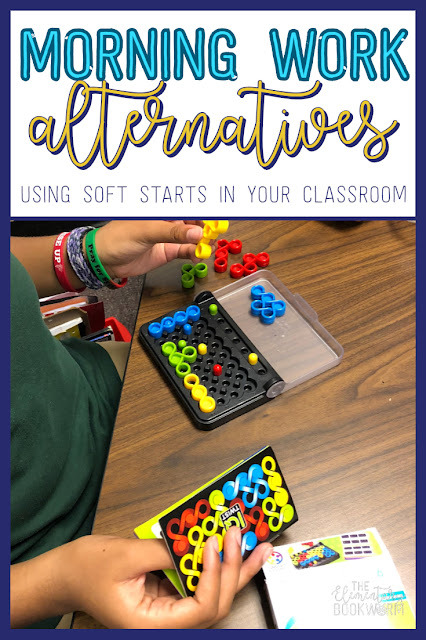 I'm even sharing my favorite lesson and a close reading passage with you! I was working on the close reading activity from my unit with some fourth-grade friends, and had an "A-HA!" moment in the middle of our work. They were having trouble understanding all of the steps involved in transporting garbage to its final destination. Then I remembered the final scenes from Toy Story 3. I started pulling up individual clips, starting with the moment the toys fall into the dumpster. We broke it up into segments and suddenly everything in our close reading passage clicked into place! In hindsight, I wish I'd watched the clips and built their background knowledge first. That's the way I ended up writing the lesson, but if you're in a time crunch it could work to do it as you read. 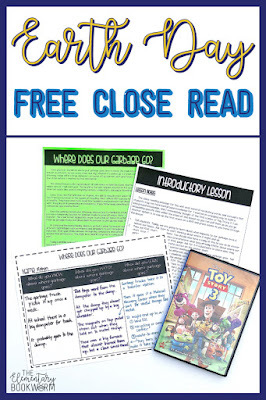 If you're super curious now, make sure you sign up for your FREE copy of the close reading passage and introductory lesson. 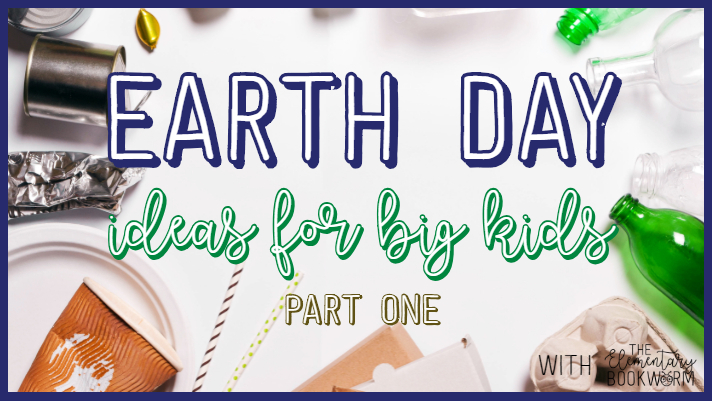 Sign up to get your FREE Earth Day lesson! I'm challenging you to work at least one of these ideas into your plans for Earth Day. Bring in a little more than a crossword puzzle or word search. 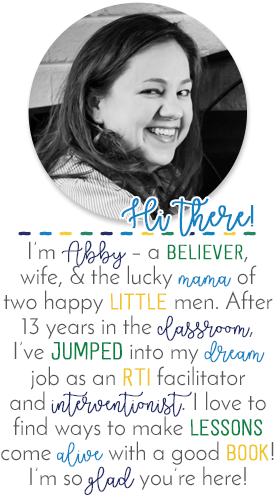 Your students will love the memories they'll make with you, and you'll have fun too! 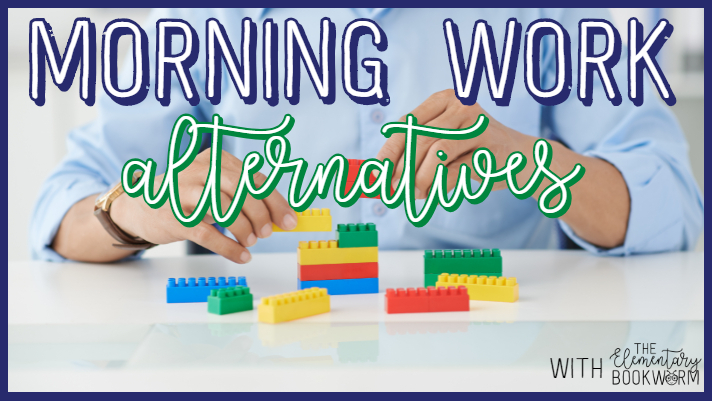 For nearly fifteen years, my classroom morning routine consisted of a packet or a worksheet that I wanted my students to complete. At least once I week I would scramble to print something off in my room for the next morning. I would spend hours making my own morning work each week to include the skills I wanted my students to review. My kids would drag themselves into our classroom and groan over another set of sentences to correct. In reality, they didn't need more math problems to solve, or a crossword puzzle to work out. I dreaded adding another set of papers to be graded. No one enjoyed morning work!! During a morning meeting last year, we were talking about tardies and absences. There were several kids who were perpetually tardy, and I wanted to "crowdsource" some solutions. Teacher Truth: Children at any age are unabashedly honest. One of my darlings spoke up and said, "They are probably trying to get out of morning work." Talk about a gut check. I could've answered that a million different ways. But they were right. Morning work was boring and terrible --- not how I want to start my day. I took a breath and said, "Then I guess we need to figure out how to make that better!" That night, I went home and started a Donor's Choose grant for all of the materials. I made sure to include organization drawers and tubs so that storing everything wouldn't be an issue in our classroom. When we reconvened the next day, my students helped me revise our Donor's Choose list until it was practically perfect. I love these rolling carts because the students could move the materials to their work stations and then roll them back when it was time to clean up. We also requested several Sterilite tubs to store some of the puzzles and logic games with smaller pieces. In my experience, game boxes aren't very sturdy and I wanted something that would last longer than a couple of months. Once the materials arrived, there were definite favorite activities that stood out each morning. The LEGO station was always popular, and the books we ordered for inspiration were a hit as well. The kids also rushed to play with the IQ games each morning. I loved that these were solo activities that they could play while they chatted with friends as everyone trickled in. There are also several challenges for each set, so it was easy to differentiate for everyone in our classroom. These two puzzles were also a hit, and could be played solo or with a friend. In fact, I enjoyed the Think Fun Izzi game so much that I bought it for my family to play as well! I hope this has given you some ideas on how to use soft start mornings in your classroom! If there's something you'd like to know more about, feel free to email me or comment on the post below. Make sure to save this to Pinterest if you'd like to come back to it in the future! Will there be six more weeks of winter, or is spring on its way? Watching Punxatawny Phil make his prediction has always been one of my favorite Groundhog Day classroom traditions. If we're in school on February 2nd, you can bet my classroom will have a few engaging lessons and student-centered activities to commemorate the day. I also have several Groundhog Day books that I like to feature in my classroom library from the latter part of January through early February. I thought I'd take some time to highlight a few of my favorite Groundhog Day books and give you a peek at my Groundhog Day unit on Teachers Pay Teachers! You can see by the state of my Groundhog Day books that these titles have been well-loved. I've used most of these titles with second, third, and fourth graders. The links I'm sharing below are affiliate links, which means that I receive a small commission at no extra cost to you. These are my Groundhog Day staples. I read them every year, and my kids love them. Gail Gibbons is one of my favorite authors, and I love the way she writes for younger audiences. I have an author basket for her books in my classroom library, so Groundhog Day lives there all year long. Substitute Groundhog is a fun fiction read-aloud that details what happens when Groundhog gets sick! My kids love making predictions about which forest friend will be able to do the job. Groundhog Gets a Say and Groundhog Weather School are both informative narratives that worked really well in my 4th-grade and 5th-grade classrooms. Big kids love picture books too, and these complemented the close reading piece we worked on in class very nicely. I use Gail Gibbons' book in my mini-lessons that week and give the students access to all three informational texts as they worked on the close reading passage activities. Several of my students enjoyed completing their Top 5 activity with a new fact from one of the informational books. "Top 5" is one of my favorite synthesizing activities. It's a simple way for me to gather information from my students, and there are very few "wrong" answers. As long as students can give me 5 significant details about a given topic, they've done exactly what I've asked! I love seeing which facts are most important (#1) for them. Gretchen Groundhog, It's Your Day! is a title that is newer to me. I LOVE reading this story with classes when I have a student who is painfully shy. Their eyes always widen and they give me the look that says, "SHE'S JUST LIKE ME!" All the heart eyes. Gretchen's uncle is too old to go out for Groundhog Day, so it's her turn to make the announcement. She's terribly shy and doesn't think she'll be able to do it. Any of the titles mentioned in this post, or any groundhog titles you may have, will work well with the reading printables I have in my Groundhog Day unit. You can actually use several of the pages any time of year! I hope you've gotten some great ideas and titles to take back to your classroom for Groundhog Day. If you have any titles I might have missed, let me know in the comments below. I'm always on the hunt for a good book. Make sure you pin this post so you can find it anytime you need it! Dr. Martin Luther King Jr. is often part of any teacher's January classroom studies. We look forward to a long weekend and plan to show a movie or read aloud a book the Friday before that explains why we have the day off. Is that enough? Are we really honoring a civil rights icon by giving him 30 to 45 minutes a year? I don't think we are. Dr. King's legacy is too big to fit into a 45-minute time slot. If we want our students to really understand the weight of his work, we need to devote more time to teach them about it. For me, that means teaching across content areas. It looks like close reading about Dr. King's life during Reader's Workshop. It sounds like students discussing civil rights and peaceful protests during Social Studies. Maybe students are writing word problems using a timeline of his life's events. Maybe you find a reader's theater about the Montgomery Bus Boycott and perform for your grade level. These lessons are all-encompassing because we want to stress the importance of his legacy. Is it time-consuming for the teacher? Absolutely. But the IMPACT of lessons like these outweighs any frustration we might feel because we spend a little longer teaching our students about his life. By the time students arrive in my classroom, they've read Martin's Big Words and seen Our Friend Martin about 1,000,000 times. They are usually aware that Dr. King delivered an important speech. They know he worked to make sure people had equal rights. My job as their 5th-grade teacher was to build on what they knew and apply it to the world they live in. I was not always good at this. I still have a lot to learn. BUT - When we know better, we do better. I started by bringing in new books and new lessons. We had conversations about social justice issues, including whether or not our schools are truly segregated. I let them draw their own conclusions, but the most important piece for me was letting them read, teach, and explore. I love anything Kadir Nelson illustrates. When I saw that he had illustrated Dr. King's speech, it was a no-brainer to add this to my classroom library. This title comes from Martin's niece, Anna. She draws from her own experiences with her "Uncle ML" to teach students his six guiding principles of integrity and nonviolence. I've found that I really love the books by Dr. King's family members the most. My class really loved this title. I think it made him more relatable, as it detailed his actions and emotions throughout the day of the March on Washington. Do your kids love this series as much as mine? Last year we called them the "big head books" 😂 and now that's all I can call them. What I love about the "big head books" is how accessible they are for a variety of readers. There is just enough visual support to keep students motivated, without making them feel like they are reading a book meant for a younger audience. 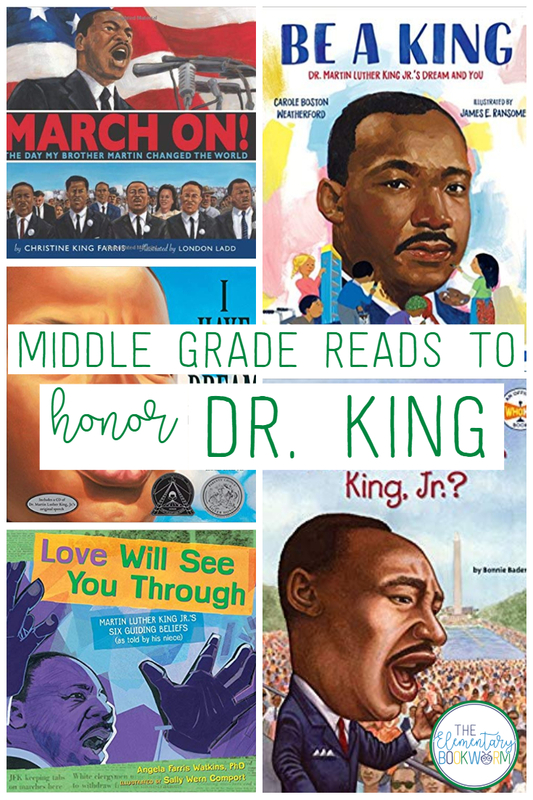 The author draws lots of parallels between Dr. King's life and the world our students know. It is beautifully written and the perfect read aloud to celebrate his legacy. I'm adding it to my "to-do" list for future Social Studies Pop-Ups for sure! If I've missed a title you think I should know about, make sure to leave it in the comments. Pin this post as well so you'll have it for many Januarys to come!